Fur clothing was used by other hominids, at least the Neanderthal man. As animal husbandry was introduced during the Neolithic, human communities got a steady source of hides. 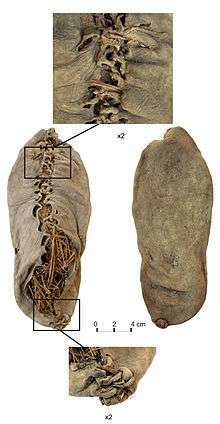 The oldest known piece of leather footwear is the Areni-1 shoe that was made in Armenia around 3,500 BCE. Parchment for use in document was introduced during the Bronze Age and later refined into vellum, before paper became commonplace. Tanning of hides to manufacture leather was introduced during the Neolithic, and is documented from Ancient Egypt around 1,300 BCE. Various substances used were tannin obtained from trees, as well as animal brains, or faeces. The odor from tanning separated the tanneries from populated areas. ↑ "The Beginning of Leather | Italian Leather". Maxwellscottbags.com. Retrieved 2012-08-15.